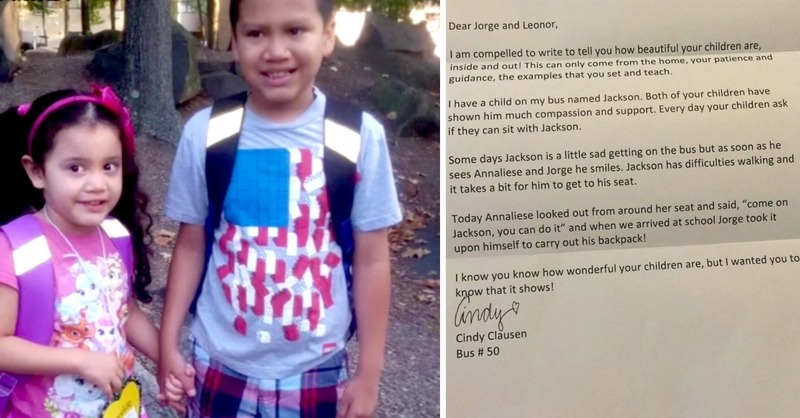 Annelise and Jorge Narvaez-Salgado had no idea that they were being watched closely every day when they climbed the stairs of the yellow Princeton, NJ, school bus. Their bus driver, Cindy Clausen, had noticed the children’s unusual behavior and was captivated by it. 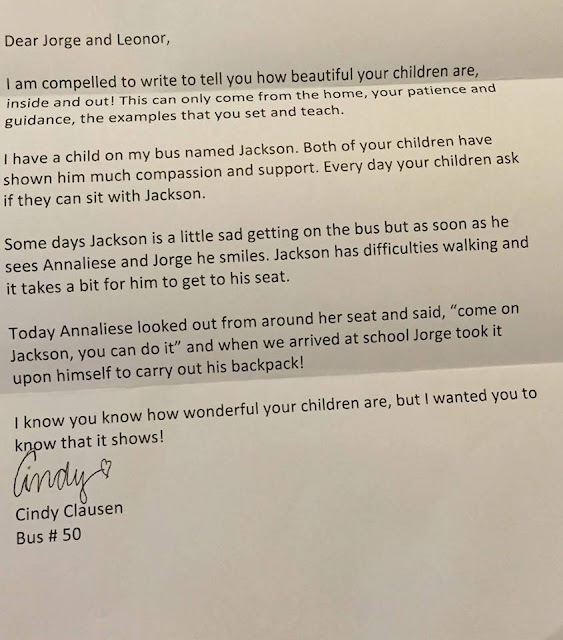 She had been working as a driver for over 23 years and had never seen children act in such a manner, so she decided it was time to make their parents aware of it… which is why she wrote them a note. Every day, the two children would make their way over to a little 7-year-old boy, Jaxson Blue, and show him that kindness still exists in this world. Jaxson suffers from a neurodegenerative disorder that affects his ability to walk, leaving him struggling to maneuver around the bus. “I am compelled to tell you how beautiful your children are, inside and out!” Clausen began the letter, going on to share a particular moment when Jaxson was having a challenging time standing up. Then, as her brother Jorge passed by the row Jaxson was sitting in, he grabbed the little boy’s backpack and swooped it over his shoulder, reassuring him that he had it and didn’t need to worry about it. It’s wonderful to see such compassion from children so young. If you were touched by their kind hearts, be sure to SHARE their story.